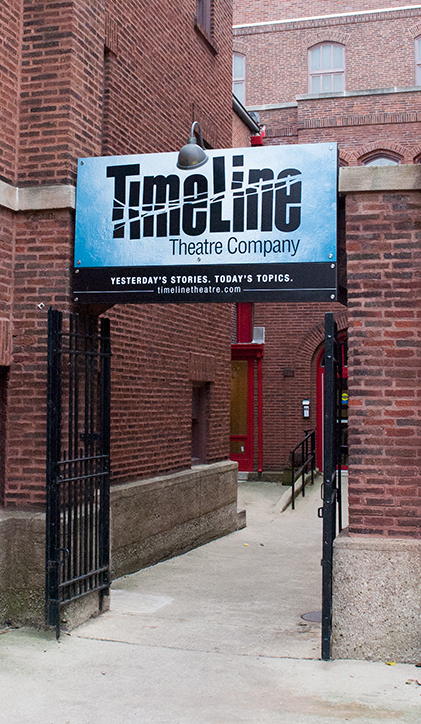 TimeLine Theatre is located at 615 W. Wellington Avenue in Chicago, near the corner of Wellington and Broadway, inside the Wellington Avenue Church building. The theatre entrance is adjacent to the church’s main entrance, through a small courtyard. Before and after your visit, we invite you to enjoy the wide variety of restaurants and other shops within walking distance of the theatre, in the heart of Chicago’s vibrant Lakeview East neighborhood! Take the Kennedy Expressway (90-94) and exit at Kimball. Turn right and go immediately into the left lane. Turn left at the first light (Belmont Avenue). 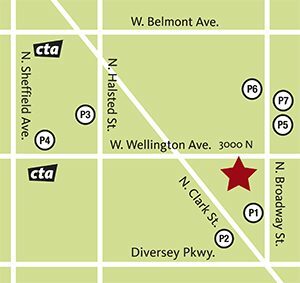 Take Belmont east to Clark Street. Turn right onto Clark Street, proceed south to Wellington Avenue. Turn left onto Wellington Avenue. Take Lake Shore Drive north. Exit at Belmont and go west about three blocks to Halsted Street. Turn left onto Halsted. Go south to Wellington Avenue. Turn left onto Wellington Avenue. Take the Kennedy Expressway (90-94) and exit at Armitage. Turn right on Armitage (East) and head east to Ashland Avenue. Turn left on Ashland and proceed north to Diversey Parkway. Turn right on Diversey and proceed east to Halsted Street. Turn left onto Halsted. Proceed north on Halsted to Wellington Avenue. Turn right onto Wellington. Exit at Belmont stop. Walk one block east to Clark Street. Turn right on Clark and proceed south two blocks to Wellington Avenue. Turn left onto Wellington. Exit at Wellington stop. Turn right out of the station and walk east approximately 3 blocks. #36 (Broadway); #8 (Halsted), #22 (Clark) and #151 (Sheridan) stop at Wellington. Lakeview East is a densely populated residential and business neighborhood. Street and metered parking is available but very limited. Note some streets are zoned for resident parking only. Currently, it is best to look on the side streets east of Broadway for free, non-permit parking. Metered parking on Broadway, Clark and selected side streets is generally in effect from 8am – 10pm and costs $2 per hour for up to 2 hours at a time. Check individual meters to confirm details. For greater convenience while attending a performance, we recommend trying the ParkChicago app, which allows you to refill a meter remotely via your mobile device. Self-park lot located about 1.5 blocks south of TimeLine, this public roof-top lot is well-lit with elevators. Closes at midnight. Price with validation (up to 6 hours) is $8. NOTE: The Broadway at Surf lot closes at midnight. Please ensure you remove your car before that time to avoid any inconvenience. Self-park lot located about 2 blocks southwest of TimeLine, this public garage next to the Landmark Century Centre complex has several floors of parking. Open 24 hours. Price with validation (up to 6 hours) is $9. Small self-park surface lot with driveway entrance located south of Ceres’ Table. Use automated pay station to pay fees in advance and leave receipt in windshield. Prices are $7 for 1-5 hours; $11 for 5-8 hours. NOTE: This lot features special pricing on Cubs game days. Self-park garage with driveway entrance located between Apartment People and Lakeview Dental Arts. Use automated pay station (credit card only). NOTE: This garage is not well lit and involves stairs/no elevator. Hospital parking garage open 24 hours, located just north of Halsted and Wellington with an entrance on Halsted. Prices are $12 for 2-4 hours; $14 for 4-6 hours. Hospital parking garage open 24 hours, located on Wellington Avenue with entrance near the El tracks. Prices are $12 for 2-4 hours; $14 for 4-6 hours. Dine at The Bagel Restaurant and Deli and park for free in their surface lot behind the restaurant. Spend at least $10 per person and you can leave your car in The Bagel lot during the show. Be sure to inform restaurant management that you are attending the show to provide car identification and confirm parking arrangements. You may be asked to present your TimeLine order or reservation confirmation. Parking facilities and operators are not directly affiliated with TimeLine. Hours, prices and availability are subject to change. Details as of November 2017. TimeLine is located about 6 blocks south of Wrigley Field. If you are traveling to the theatre during baseball season, we recommend checking the Cubs schedule and planning your travel time and routes accordingly!